A weekend deluge wreaked havoc with the fixtures in the Leeds Combination Leagues this weekend. The Sanford Cup, Jubilee Premier and Premier Division saw no action as playing surfaces heaved under the pressure of heavy rain. Whilst Leeds United’s promotion push faltered, Division 1 side Bardsey showed no signs of slowing down as they demolished Crown & Anchor 5-4. Adam Prince (2), Jamie Webster and Jake Dall grabbed the goals for Crown & Anchor. Bardsey starlet Jordan Deacey struck twice with Jack Walsh, Eddie Clayton and Tom Franklin rounding off the scoring for the league leaders. That result moved Bardsey 10 points clear of nearest challengers Acorn who, until recently, were just a point off top spot themselves. The only remaining Division 1 fixture was played out between True Brit and Commercial, with the former emerging victorious. Chris Meeson (2), Ash Anderson and Dan Ajibona found the net for True Brit whilst Yusef Yate, Anthony Coates and Ryan Mcgee scored for Commercial. True Brit’s 4-3 win moved them to within touching distance of Acorn, who they will be confident of toppling in the weeks to come. Commercial, meanwhile, remain stuck in the Division 1 nether zone in seventh position. Only one Division 2 game survived the weather and Headingley will be glad of it after they claimed a narrow 2-1 victory over strugglers Amaranth Crossgates Athletic. Michael Evans and Jordan Parkinson scored for Headingley who have finally put some distance between themselves and the bottom of the division. Amaranth, meanwhile, remain in real trouble, just five points ahead of the Division’s bottom side, Sporting Pudsey, who have shown serious signs of recovery in recent weeks. 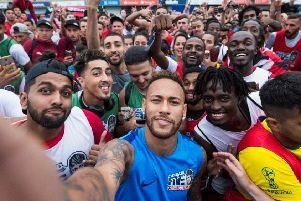 It didn’t quite have the pull of the Madrid derby but the clash between Bramley Amateurs and Athletico Bramley in Division 3 was still a feisty affair. Bramley Amateurs showed an insouciance to the formbook, running out 3-1 victors over their title-chasing neighbours. That result sees Amateurs move up to sixth spot while Athletico were left to rue their inability to close the gap at the top which remains at four points. 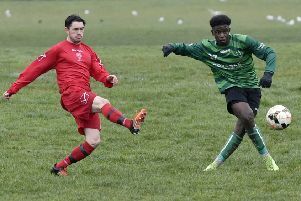 n Walkers Hounds regained top spot in the Heavy Woollen Sunday League Premier Division with a 2-1 win over fifth-placed Roberttown Rovers in the only game to take place owing to the wet weather, writes ANDY WILSON. Danny Stocker and Ryan Wadsworth hit the net for Hounds with Matthew Bolton firing Roberttown’s consolation. The win sees Hounds lead Deighton WMC by a single point having played an equal number of games. The semi-final of the Heavy Woollen Challenge Cup takes place this Sunday between Linthwaite and Walkers Hounds at Overthorpe Sports Club with an 11am kick off. In the Wakefield Sunday League, Wakefield Athletic B lost their spot at the top of the Championship One table after suffering a 4-1 defeat at Crofton Colts. Victory for the Colts means they leapfrog Wakefield into top spot, and opens up a two-point gap. Crofton could further extend that lead with the two matches in hand they have over Athletic. Elsewhere in Championship 1, Horbury Slazengers remain six points adrift at the foot of the table after drawing 1-1 away to fellow strugglers Thatched House. Rock Inn closed the gap to Premiership 2 leaders Old Bank as they triumphed 5-2 at Whitwood Metrostars. Rock Inn sit just 13 points behind the table-toppers, although they do have a match in hand on Old Bank. West End Terriers ended a three-match losing streak after defeating Redoubt 5-2.